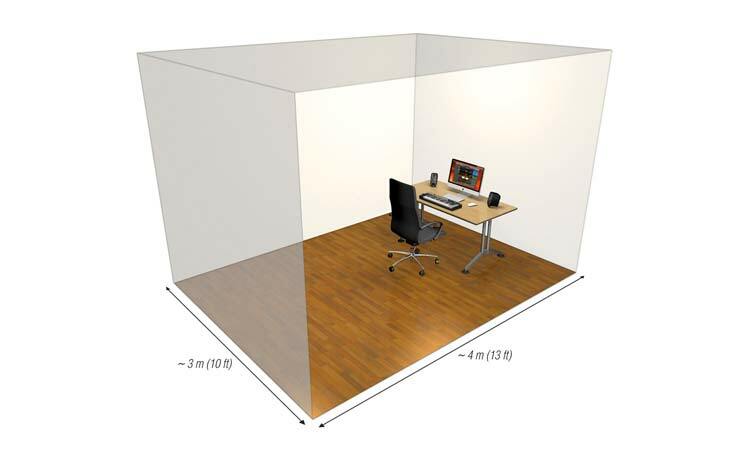 Most project and home studios are small — typically rooms under 42 cubic meter /1500 cubic feet — or about the size of a typical bedroom. When working in such small spaces, a small monitor system performs better and gives you a more accurate representation of your mixes than large ones because smaller systems don’t provide strong reverberating fields and prevent standing waves from building up in the room especially on the low end causing unnatural frequency response, and that’s very important. Smaller monitors, when designed correctly, provide the best sound for your small space. Why? For starters, small nearfield monitors allow you to sit much closer to the sound source at lower sound pressure level (SPL), so they can be heard directly by the ears without the reflections produced by walls, ceilings or other items in the room — these reflections will inevitably color the sound in an unreliable and unrealistic way. With the smallest footprint in the world for a reference monitor, iLoud Micro Monitors can be placed reliably in the smallest possible spaces without compromising a truly professional monitoring situation and ensuring you are hearing the truth of your music. Small studios rely on small tables/desks typically attached to or positioned against the wall. In addition to the obvious issue of lack of space on small table for mid-sized monitors, a 5”/6” studio monitor in these conditions will sound extremely “boomy” and undefined. Add this to the midrange “dip” typically found on the budget monitors and the sonic picture will be totally compromised. 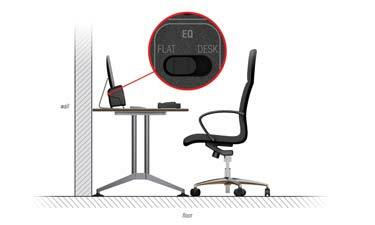 To get a barely listenable response from a 5 or 6” monitor when placed on a desk that is attached to the rear wall, the monitor needs to be moved away from the wall by at least 20-30 cm. This plus the monitor depth itself will take up the entire working space on a regular desk. iLoud Micro Monitors have a response that is calibrated to sound flat on a desk even when there is a very close wall behind. This is controlled with the EQ switches on the rear of the unit. You can set these switches according to where your monitors are placed. Also the total depth of iLoud Micro Monitor is only 13-14 cm giving you the space you need to put them away from the rear wall without taking up valuable table space. Medium sized monitors have at least 15-20cm (5.9–7.8”) distance between the centers of the woofer and tweeter. 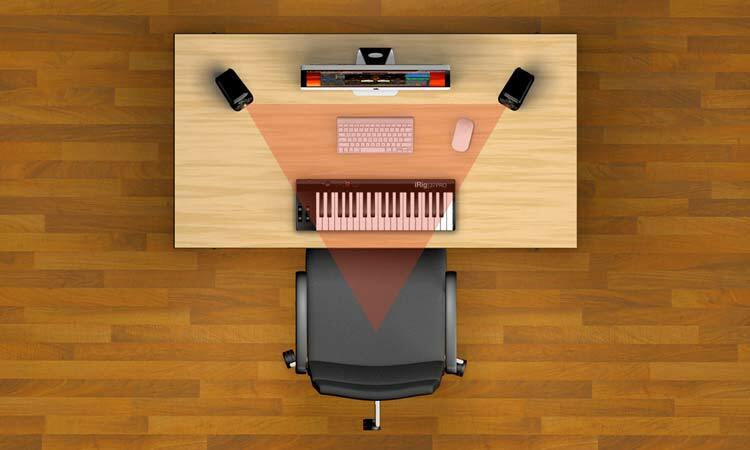 The typical short distance between the monitors and your ears in a small studio will not be in the “sweet spot” where the two drivers blend completely, presenting you with an incomplete audio picture. Therefore “decisions” you make on the sound program that is monitored are very difficult to make because the sound appears to be coming from two separated sources, the woofers and the tweeters, instead of one “convergence point” that provides a focused representation of your sound. iLoud Micro Monitors have the centers of the two drivers at only 6 cm (2.3”) distance which puts their convergence point very close — starting at 50 cm (19.6”), a typical distance when placing the monitors beside a laptop. This provides a very focused and clear sound at shorter distances from the source making them the best option for small studio spaces. This short distance and ultra-accurate blending of sources immensely facilitates mix decisions and sound shaping. In reality, you never need ultra high sound pressure levels in a small studio, and for this reason you don’t need a big woofer. 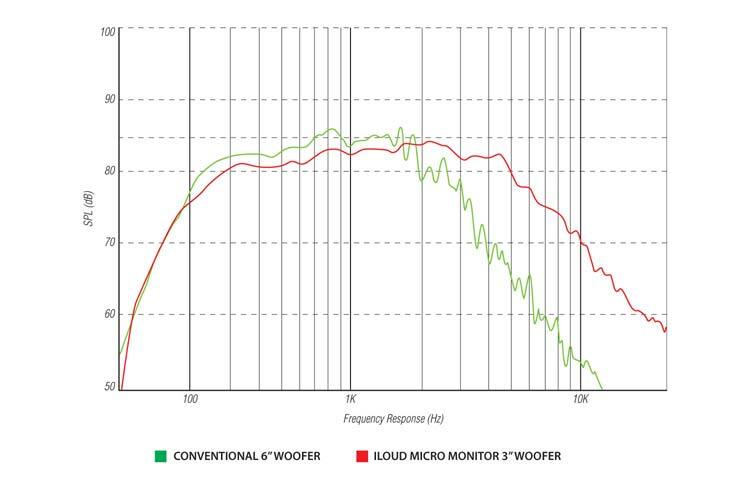 iLoud Micro Monitor’s small 3” woofer can go down to 55Hz (-3dB) because of proper tuning of the enclosure and appropriate DSP management. But not all woofers sound the same. Different woofer materials affect the performance of the monitor and can color the sound depending on the material. Typical budget and mid-sized 5/6” monitors´ woofers are made of fiberglass or polypropylene that while cooler and more attractive to the eye, are heavier and therefore slow to move. As a result they tend to lack accurate transient response, and the midrange can appear “distant” and undefined. This is not the ideal environment for proper and accurate mixing. The iLoud Micro Monitor features a 3” high-rigidity custom composite material woofer which gives it a lighting-fast response that can represent transients and reproduce the midrange with an accuracy that is simply not possible for woofers typically used on budget monitors. Small budget monitors typically have passive crossovers, weak power amps and low quality drivers, plus resonant and compromised enclosures. Inaccurate crossovers can make the response at the crossover point dramatically skewed both in magnitude and phase. 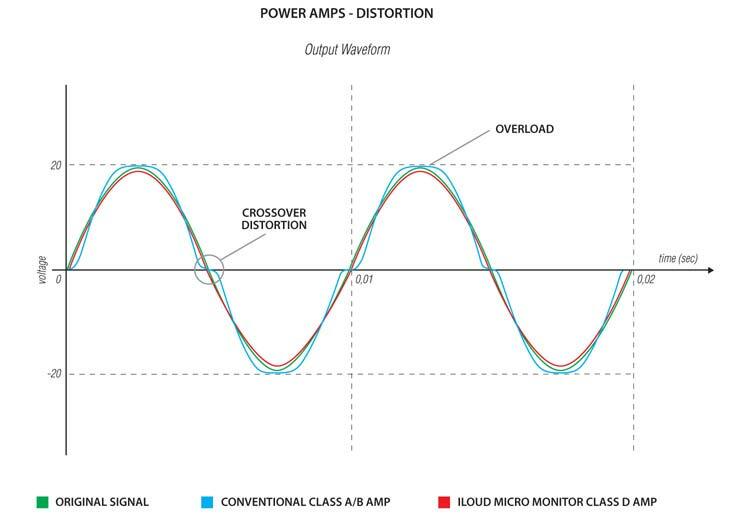 To minimize this problem most budget monitor manufacturers tend to design the crossover with some space in frequency response between the two drivers that can compromise the response on the midrange and create the “midrange dip” you always hear on budget "monitors”. 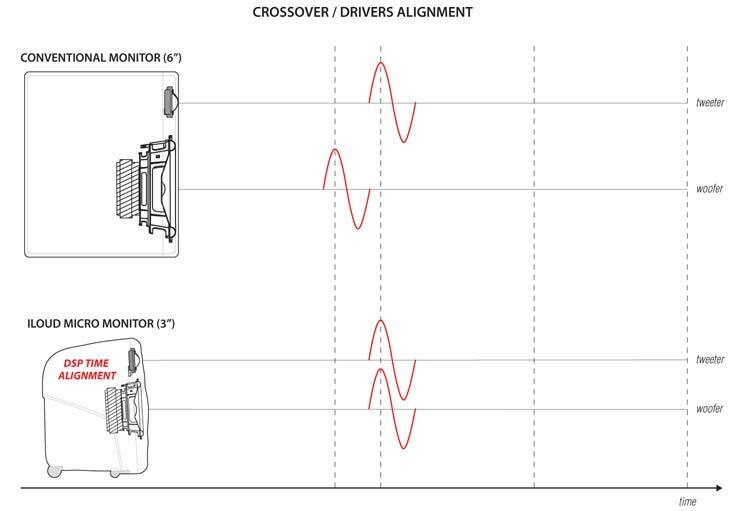 Instead, professional monitors are very accurate with crossovers and a lot of care is always taken to perfectly match the drivers at the crossover points, both in magnitude and phase. The crossover point of a 2-way studio monitor falls exactly in the middle of the spectrum typically where vocals live, and a bad crossover actually makes it impossible to make good decisions when mixing. iLoud Micro Monitor has an extremely sophisticated crossover design. The two drivers are digitally crossed over at about 3.5 kHz thanks to the exceptional mid-range performance of the woofer, and they are perfectly time-aligned by the DSP. This means that iLoud Micro Monitor sounds like a single, defined “point” in space, just as if it was a single unique sound source instead of two separated speakers. This makes mixing a lot easier because the sonic picture appears true to what it actually is immediately to your ear/brain. iLoud Micro Monitor is bi-amplified with power amps that are used at 50-60% of the power they could deliver. This means they are always working in full linear range with really negligible distortion up to the physical drivers limit. Budget and small monitors are typically not bi-amped, meaning that there is only one power amp that powers all components. 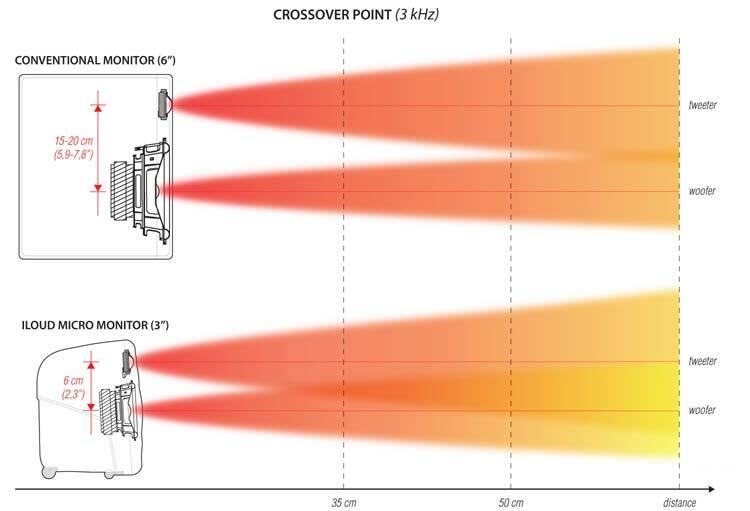 The crossover is passive and the power amp is normally a low-wattage class A-B integrated design, that delivers limited current, has a limited transient response and tends to distort quite easily because they are always used at 100% of what they can do. A bi-amped system connects the drivers directly to the power amps delivering an exceptionally tight and damped dynamic response in comparison with budget and comparable small size monitors.